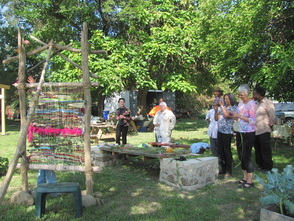 Please feel free to visit our Earth Loom and weave yarn, thread, fabric , plants, or pick something from our gardens. Thanks to this community art project, everyone can leave a piece of themselves when they visit us at City Rising Farm! 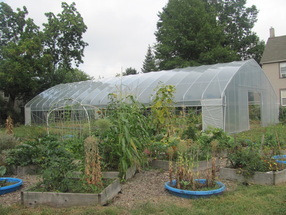 Our High Tunnel allows us to provide even more fresh food and urban agriculture education opportunities! As a community art project, we created an oven, made from all-natural materials, that helps us cook healthy, fresh meals for our monthly potlucks! This Slip-Form Bench gives our gardeners somewhere to relax and chat after a long day of digging.